Summer breaks don’t exist for detector prototypes. 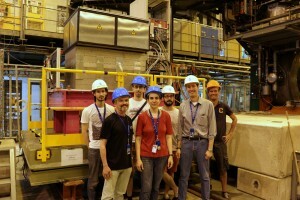 For almost three weeks in July – around the time that a new temperature record of 39.7 degrees was measured in Geneva – the team working on the technological prototype of a potential hadronic calorimeter for the ILD detector at the ILC took data at the Super Proton Synchrotron test beam at CERN. The technological protoype currently consists of various layers equipped with scintillator tiles and strips of different geometries. “We want to build a fully equipped prototype consisting of 40 layers in the coming years, and experience from this testbeam is important input to chose one option,” says Katja Krüger, test beam coordinator from DESY.